The latest musings from our guest blogger Patrick..
As the only North Carolinian not obsessed with NASCAR and all things auto racing, I get a lot of quizzical looks, when I fail to respond to provocative opinions about the racing topics of the day. I stare blankly for a bit then look nervous and fidget a bit when racing pops up. And yes, I work from home and never go anywhere; I hide for a living, and look down in supermarkets, but it still pops up. I can be filling gas in a driving rain with a hoodie pulled low, and the driver next to me will yell above the hurricane force winds, “So what do you think of Junior’s chances at the Brickyard 400? You know, with the Dale Jarrett thing and all?” I do the blank stare fidget thing, and I get the “you must be a low down dirty rotten scoundrel. Worse than that, a Yankee.” look. I get that look a lot. I sort of slink back home and try not to leave the house for a few weeks. 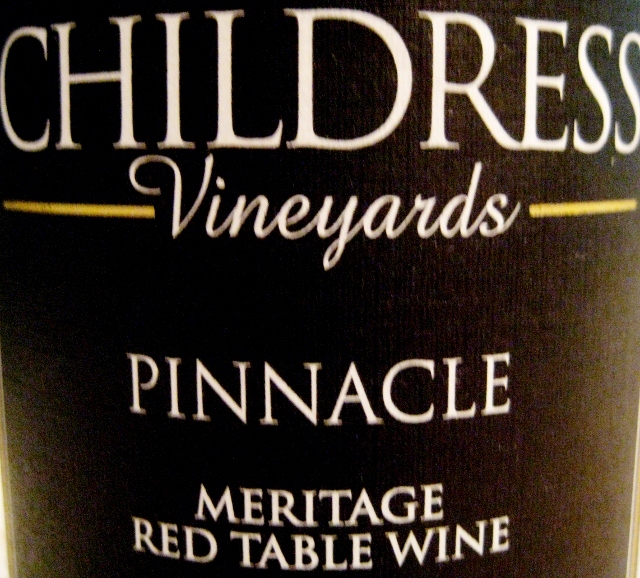 So to say the least, my hand shook a bit as it hovered over the Childress Vineyards Pinnacle Meritage Red Table Wine. Richard Childress, or so anyone at any gas station or supermarket will tell me, is a legendary team owner. After a comparatively successful driving career, Childress really struck pay dirt as a team owner with Dale Earnhardt as his driver. Brave I am not, but I really wanted a nice glass of wine tonight, so I took the plunge. A Meritage wine (rhymes with heritage, not garage) is a proprietary wine term that essentially means a Bordeaux style blend. Typically this type of wine has Cabernet Sauvignon, Merlot, Cabernet Franc, and a few other red grapes in the blend. They tend to be softer and smoother to drink than a pure varietal red wine. I like the Bordeaux blends, so it isn’t a great leap into the Meritage wines. Mr. Childress, either in spite of or because of his amazing success in racing, has crafted a wonderful example of a Meritage wine. I recommend decanting or using an aerator, since it comes out of the bottle with strong tannins and a bit chalky taste. With a bit of air though, the big full flavors and rich silky texture really shines. I am anxious to try more of racing’s finest soon. To begin, I would like to say what an honor it is to be asked to write a guest blog entry. As a child, playing in the cane fields of Hawaii, I would look out across the endless beaches where the hula dancers frolicked and think, “Someday I too will write a blog entry for Carolina Locavore.” At long last loyal readers, my day has come. I can set aside the cure for cancer, the workable Middle East peace proposal, the new pitch that would propel the Cubs to the World Series. I have accomplished that for which I was set on this earth. Ah, but now for a topic. I can’t cook. I have a vague idea where the refrigerator is in our house. I don’t particularly care for vegetables. And my knowledge of North Carolina agriculture begins and ends with the pretty sign at the entrance to Lee County depicting our local agriculture products: cows, lemons and poodles. At least that is what it looks like when driving by at speed. I think we grow tobacco and cotton. I don’t believe you can eat either one. So here I sit, a fine glass of Biltmore Estate Century Red wine at my side, and I am really stumped. As an aside, Biltmore Estate is a wonderful local winery located in the hills above Asheville on the grounds of the Biltmore Estate. It is one of the most popular wineries on the East Coast, and our local grocery store carries several different bottles. The winery has been in business since 1985, very old by North Carolina Winery standards. The first vines were planted in 1971. European varietals such as Chardonnay, Riesling, Cabernet Franc, Cabernet Sauvignon, and Merlot are grown on the estate as well as newer American-French hybrid varietals such as Viogner. 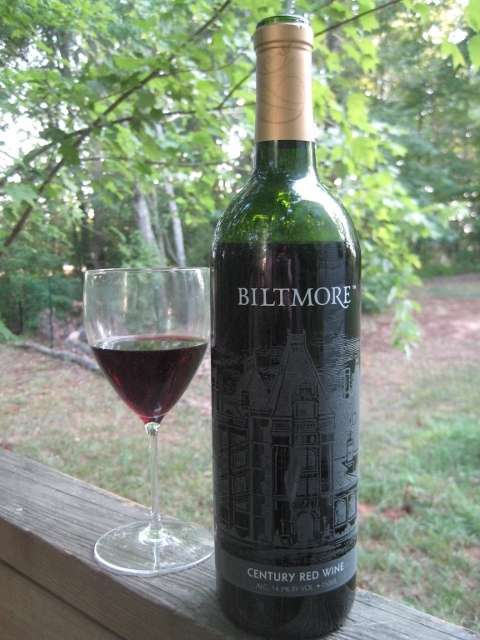 Biltmore has created quite a reputation for creating California style varietal wines on the east coast. The high elevation (2,200 feet on average) provides the ideal warm sunny days and cool nights so beneficial to European and California varietals. This particular wine is thick and rich. The copy on the side of the bottle says it is an Italian style wine, but I think it is spicy like a Rioja from Spain. We had it with a rich tomato and ground beef casserole tonight, and it stood up to the acids in the tomatoes as well as the hearty corn bread topping. Their Chardonnay is delightful too, and I can’t wait to taste their Rieslings (a particular weakness of mine).